Originally published in Hidden Treasure: The National Library of Medicine, 2011. A swell pair of all-American gams serve as a risqué reminder to keep pulling for victory over both Japan and mosquitoes. 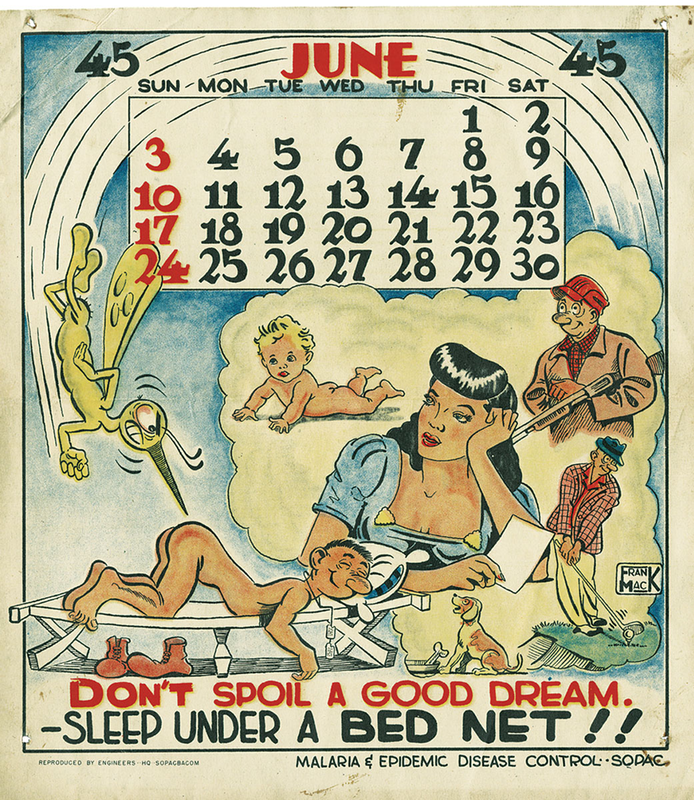 These pinup calendars were part of a larger antimalarial campaign that emphasized the use of bed nets, mosquito repellent, Atabrine (an antimalarial pill), avoidance of places where mosquitoes swarm at night, and keeping skin covered. To young American GIs waging World War II in the South Pacific malaria posed a threat as dire as that of the enemy’s military forces. Tens of thousands of men died, due in part to shortages of quinine, then the only available treatment. Early in the conflict the army’s surgeon general established a malaria control office that provided ample supplies of the newly developed antimalarial agent Atabrine. Soldiers in the field, however, didn’t view the threat seriously enough to swallow the bitter pill and risk its malaria-mimicking side effects: headaches, nausea, and vomiting. Consequently, only one-third of his troops were fit for combat at any given time, according to General Douglas MacArthur, the rest either afflicted by the disease or recovering. In response, Armed Forces Radio began broadcasting so many malaria advisories that it became known as “the mosquito network” among the grunts, and “antimalaria squads” offered education and treatment in the field. But, as with the Private Snafu series of animated cartoons, GIs responded most avidly to information presented as entertainment. In 1944 an enlisted artist named Frank Mack was assigned the duty of designing pinup calendars to reach these homesick, bored, and horny soldiers, sailors, and marines. If Mack, who went on after the war to work on the “Ripley’s Believe It or Not” newspaper syndicated comics feature, lacked the artistic skill that peers such as Dr. Seuss brought to their own wartime posters, his rambunctious style, well showcased in the “Malaria Moe” comic strips he drew for the Stars and Stripes military newspaper, was an ideal choice for the task at hand. Sleepytime down SOPAC (South Pacific) way. If Moe is too recklessly macho to let fears of a wee mosquito bite prick his dream balloon of hetero homefront joys, maybe the threat of figurative (and literal!) buggery will drive the point home. The two months featured here are charming examples of Mack’s work. In the pinup for May 1945 a comely redhead in a see-through nightie poses à la Rita Hayworth alongside a photo of her soldier boy, promising hubba-hubba-and-how, if only he’ll thwart the insect foe and return, hale and hearty, to her yearning arms. Mack draws her with the kind of clunky eroticism GIs already enjoyed in novelty postcards, aircraft nose art, Tijuana bibles, and tattoos. More homespun desires, with a note of slapstick ribaldry, turn up in June’s pinup. Here, Malaria Moe himself, buck naked and barracks-bound, dreams of the pleasures waiting back home, blissfully unaware that the gum-bubble sheen of his upturned buttocks provides an irresistible target for an especially ornery and enormous specimen of, perhaps, Anopheles flavirostris, dubbed “Skeeter” in Mack’s Stars and Stripes comics. These rare pinup calendars are fascinating not only as images but as objects—souvenirs of military life as lived. The tack holes in their corners testify to active duty decades ago, perhaps hanging on a medic’s office wall to attract the eye of some green, buck-naked private. There, vulnerable as Frank Mack’s hapless Moe, he might find distraction from “bend over and cough” indignity by counting the remaining calendar days until—thanks to his bug net, his M1, and a bit of luck—he’d come marching home, ready to lay that pistol down and commence the postwar mission of producing bouncing baby boomers. Mike “Sport” Murphy is a singer and songwriter who has released three albums on the Kill Rock Stars label and has written frequently about popular culture for the New York Post and the New York Daily News. He lives with his wife and two children on Long Island, where his hobbies include constructing bogus habitat dioramas, cartooning, and hosting monthly gatherings devoted to the tasting of exotic spirits.